From MCCONNELL 229: "The River Crouch, south of the Naze, meets the North Sea at Foulness Point." From HUGHES AND GEDULD 228: "a river in Essex about twenty-four miles long. It flows from Brentwood to Foulness point, wher eit enters the North Sea." From MCCONNELL 227: "a promontory, north of London (in the county of Essex), extending into the North Sea"
From HUGHES AND GEDULD 230: "a promontory on the North Sea coast of Essex, about four miles south of the seaport of Harwich." From MCCONNELL 225: "the artificially enlarged shipping area of the Thames"
From HUGHES AND GEDULD 232: "Strictly speaking this refers to the stretch of the river Thames between London Bridge (on the west) and Cuckold's Point (on the east), near West India Dock. But more popularly it has come to signify the area of London below (i.e., east of) London Bridge. Fairly large sea-going vessels have access to the port of London up to this part of the Thames." From MCCONNELL 241: "room in which food is cleaned or cut before being taken to the kitchen for cooking; hence the most malodorous and usually the dirtiest room of the house"
GANGNES: MCCONNELL 240 identifies this as a "contradiction. The fourth start had fallen late Sunday night, north of where the narrator and the curate are hiding..., and the narrator only hears of it later, from his brother. So it is impossible for him to know, at the time, that this i the fifth star; he should think it is the fourth." A case could be made, however, that the narrator is writing this in retrospect, and therefore could be imposing his later knowledge of which cylinder it is onto his impressions at the time. HUGHES AND GEDULD further complicate the matter by responding to MCCONNELL: "But the first three cylinders fell one after the other late on the nights of Thursday, Friday, and Saturday. Doubtless the narrator simply assumes that the fourth fell 'late Sunday night' and that this one (late Monday night) is the fifth. ... The real trouble is that--far from being unaware of the fourth cylinder--the narrator should be only too well acquainted with it. It fell the previous night, into Bushey Park, which he and the curate have just traversed. But Wells has forgetfully caused the park to contain nothing more remarkable than 'the deer going to and fro under the chestnuts.'" From MCCONNELL 240: "Popular newspapers frequently issued these supplements, cheap and crude reproductions, 'suitable for framing,' of famous works of art or stirring historical scenes; they decorated the homes of many lower middle class families." GANGNES: See notes below from MCCONNELL and HUGHES AND GEDULD about a possible inconsistency or oversight in the order of the cylinder landings. This makes mapping them even more complicated. From HUGHES AND GEDULD 216: "a fashionable name for a kind of small suburban house--in this case a two-family structure--popularly considered to be a 'better class' of dwelling"
GANGNES: Americans might call this kind of house a high-end "duplex," in that the structure itself is the size of a large house, but there are two "homes" within it, separated by a long dividing wall. Many semi-detached houses have two floors. From MCCONNELL 230: "gigantic sea beast of Biblical legend"
GANGNES: See various Biblical references and Wikipedia article on the Leviathan. From MCCONNELL 229: "walls above the main deck to protect the passengers from wind and driving rain"
From MCCONNELL 228: "a warship with a heavy iron beak or prow for penetrating the hull of an enemy"
From MCCONNELL 227: "ships carrying coal"
From MCCONNELL 232: smacks are "single-masted, light sailing vessels used as tenders for warships"
From MCCONNELL 226: "'Automatic mines' are mines set to detonate on contact with any moving object; they are so called to distinguish them from mines exploded by electric current from shore. ... The mines are set to block the expected advance of the Martians into the counties (Leicester, Warwick, Nottinghamshire, etc.) in the middle of England." From MCCONNELL 225: "crewmembers of a lighter, or unpowered barge used to unload cargo ships in harbor"
From HUGHES AND GEDULD 215: "sailors on or owners of lighters or barges (boats used in the 'lightening,' or unloading, of large ships)"
From MCCONNELL170: "That is, he drove the horse-drawn carriage of the heavy field guns." GANGNES: As other scholars have pointed out (e.g., HUGHES AND GEDULD 210), the marked difference in the role of the artilleryman in the Pearson's as compared with the novel constitutes a significant change between the two versions. He is the "man" in the new chapter--"The Man on Putney Hill"--added for the volume, and he is a conduit through which the novel explores how humankind might grapple (or fail to grapple) with such a crisis as the Martian invasion. See Installment 9. GANGNES: MCCONNELL is partially incorrect here; his citation is more thorough in that it addresses both the pillar of fire and pillar of smoke, but the appropriate chapter is Exodus 13, not Exodus 15. The most thorough and correct citation here would be a combination of the two--Exodus 13:21-22--which STOVER cites, though inexplicably as a note at the beginning of Chapter XII rather than at the textual reference. From MCCONNELL 173: "In Exodus 15:21-22, God sends a pillar of fire to guide the Israelites through the Sinai Desert by night, and a pillar of cloud to guide them by day." From HUGHES AND GEDULD 209: "See Exodus 13:21: 'And the Lord went before them [to guide the Israelites through the Sinai] ... by night in a pillar of fire." From STOVER 114: [quotes Exodus 13:21-22, then:] "As the Lord guided the Israelites through the Sinai desert, so the Martians lead humanity through a wasteland of suffering. Ahead, leaving the old order behind, is the promise of world unity." From MCCONNELL 171: "In Greek myth the Titans were the gigantic and violent pre-Olympian gods whom Zeus vanquished in establishing the rule of reason and order." From MCCONNELL 171: "formation for a conventional attack"
From MCCONNELL: "To 'unlimber' a gun is to detach it from its limber, a two-wheeled carriage drawn by four to six horses, and prepare it for firing." From MCCONNELL 169: "giant figures"
A flash, and it came out vividly, heeling over one way with two feet in the air, to vanish and reappear almost instantly as it seemed, with the next flash, a hundred yards nearer. From MCCONNELL 164: "This is a remarkable anticipation of the 'strobe effect' of rapid flashes of light, which we have come to associate (through films as much as through real experience of warfare) with modern battle scenes." From MCCONNELL 163: "Any three-legged support, although the most common instance of the 'tripod' for Wells's readers would probably have been the tripod on which older cameras were mounted." From MCCONNELL 161: "European variety of rose, with very pale red flowers"
From MCCONNELL 160: "The period from 1890 to the First World War has been called the 'golden age' of the machine gun, and was an era of intensive development of new weapons of all sorts. ... [B]y 1898 technology had produced an amazingly wide range of designs." I’m selling my bit of a pig. GANGNES: HUGHES AND GEDULD and STOVER both disagree with MCCONNELL about the meaning of this phrase. From MCCONNELL 159: "The landlord fears he may be selling (not buying) a 'pig in a poke.'" From HUGHES AND GEDULD 207: "One nineteenth-century slang meaning of 'pig' was goods or property. Hence the sentence might simply men: 'I'm selling my bit of property.' Another slang meaning of 'pig' was nag, donkey, or moke; while 'bit of' was an adjectival term that could be used variously to express affection for the subject it preceded. ... Another possibility is a real pig, i.e., the landlord is surprised--after asking a pig buyer to pay a pound and drive the pig home himself--to be offered two pounds with a promise moreover to return the pig. According to this, people are simply talking at cross-purposes, and the narrator then explains that he wants a dogcart, not a pig." From STOVER 98: "The landlord is puzzled by the narrator's haste to pay two pounds for his 'bit of pig' (=his valuable piece of property) coupled with a strong promise to return it." From MCCONNELL 159: "a light, two-wheeled vehicle with two seats, back to back: horse-drawn"
From MCCONNELL158: "An apparent slip. Everywhere else these cousins are the narrator's cousins, not his wife's." From MCCONNELL 156: "In Matthew 4:19 Christ tells Peter and Andrew that He will make them 'fishers of men.'" GANGNES: Note here that HUGHES AND GEDULD disagree with MCCONNELL's identification of the reference. From MCCONNELL 289-90: "A last, and very curious, invocation of the sub-theme of colonial warfare and exploitation. In 1877 Chief Joseph of the Nez Percé Indians had surrendered to the United States Army in a noble and widely-reported speech: 'I am tired of fighting. Our chiefs are killed. . . . Hear me, my chiefs, I am tired. My heart is sick and sad. From where the sun now stands I will fight no more for ever.' Wells, by associating the tragic dignity of Chief Joseph's language with the now-defeated Martian invader, achieves a striking reversal of emotion. For we now understand that it is the Martians, pathetically overspecialized prisoners of their own technology, who are the truly pitiable, foredoomed losers of this war of the worlds, of ecologies, of relationships to Nature." From HUGHES AND GEDULD 224: MCCONNELL's comment is "farfetched. ... [T]he Nez Perce in Wells's day were unsung, and he would not deal in such an obscure allusion." From MCCONNELL 297: "A contradiction. In Book I, Chapter Fifteen, the black smoke is said to produce unusual lines in the blue of the spectrum." GANGNES: This contradiction appears in the volume because of an added passage in Chapter XV. See note in Installment 6. From MCCONNELL 288: "causing decay or rottenness"
From MCCONNELL 286: "The incredibly strong, unruly hero of Jewish folklore whose exploits are celebrated in Judges 13:1-16:31. Taken prisoner by the Philistines, he destroyed himself and them by pulling down the walls of their palace." From MCCONNELL 265: "Rotting from within. This is an instance of 'foreshadowing' in the classic tradition of the Victorian novel. The death of the red Martian weed is our first hint that the invasion of the Martians themselves may be doomed to failure through the same 'natural' processes." From MCCONNELL 259: "a large key-ring, for keeping all the keys of a household"
From MCCONNELL 258: "another jumble of Biblical allusions, mainly to the Book of Amos in the Old Testament and to Revelation in the New." From HUGHES AND GEDULD 219: "Most of the passage is merely biblical-sounding rhetoric. 'I have been still too long' apparently echoes 42:14: 'I have been still, and refrained myself.'" GANGNES: The 1898 edition changes "Sutton" to "Epsom." From MCCONNELL 198: "The town of Epsom, south of London, is the annual site of the Derby." From MCCONNELL 206: "guns designed to fire at intervals of one minute"
GANGNES: MCCONNELL and HUGHES AND GEDULD seem to be at odds here about the historical significance of this reference. STOVER (147) agrees with HUGHES AND GEDULD. From MCCONNELL 206: "From September 2 to October 7, 1812, the French Army of Napoleon occupied Moscow, burning and destroying more than three-fourths of the city. They were finally compelled to retreat, however, due to Russian guerrilla resistance and the impossibility of acquiring adequate provisions." From HUGHES AND GEDULD 213: "To frustrate the Martians by destroying their major objective, London, as the Russians did to Napoleon in 1812 by setting fire to Moscow." From MCCONNELL 203: "prepared to fire"
From MCCONNELL 202: "equivalent of fifty dollars at the time"
From MCCONNELL 199: "The first practical electric light had been developed by Thomas Edison in 1879, but the cities of Europe and America were still lit by gas at the time of the story." From MCCONNELL 198: "the 'Coventry' tricycle, two wheels with a much larger supporting wheel to one side, current around 1876"
From MCCONNELL 197: "That is, an official statement which does not quite claim to be an official statement." From MCCONNELL 196: "heavy cannon mounted on carriages"
From MCCONNELL 195: "The Salvation Army was founded in 1878 by the Methodist minister and social worker William Booth, for the purpose of aiding the inhabitants of the terrible slums in the East End of London." From MCCONNELL 195: "That is, the authorities are blocking off the area from which the Martian invasion comes." From MCCONNELL 194: The first "tube"/underground railway was opened in London in 1890. From MCCONNELL 193: "One of the first hospitals and nurseries for abandoned or illegitimate children, the Foundling Hospital was founded in 1739 in the London district of Bloomsbury." From HUGHES AND GEDULD 212: "The Founding Hospital, in Bloomsbury, London, near the British Museum, was established in 1739 by Thomas Coram. Despite its name, it was not a home for foundlings but a shelter for illegitimate children whose mothers were known." From MCCONNELL 193: "Two evening papers. The Sun was published 1893-1906, the Referee 1877-1928. From HUGHES AND GEDULD 212: "The Sun, London's first popular halfpenny evening newspaper, was established in 1893 by T. P. O'Connor. A former London weekly, the Referee (founded 1877), was popular for its focus on humor, satire, sports, and theater." GANGNES: The Referee was a "Sunday sporting newspaper"; the Sun was a Tory newspaper. Brake, Laurel, and Marysa Demoor, editors. Dictionary of Nineteenth-Century Journalism in Great Britain and Ireland. Academia Press and The British Library, 2009, pp. 317; 555. From MCCONNELL 193: "light cavalry specializing in swift attack"
From HUGHES AND GEDULD 212: "Established in 1880, St. James's Gazette was a pro-Tory paper with features that also appealed to readers with intellectual literary interests. GANGNES: St. James's Gazette (Pearson's mistakenly leaves off the second "S") was a conservative daily broadsheet. It included social, political, and literary commentary, news, marriage announcements, stock market prices, and advertisements. Brake, Laurel, and Marysa Demoor, editors. Dictionary of Nineteenth-Century Journalism in Great Britain and Ireland. Academia Press and The British Library, 2009, p. 551. From HUGHES AND GEDULD 199: Nice Observatory was "France's most important nineteenth-century observatory." It was constructed in 1880 on Mt. Gros, northeast of Nice. It used a 30" refracting telescope. From MCCONNELL 126: Henri Joseph Anastase Perrotin (1845-1904) was a French astronomer who worked at the Nice Observatory 1880-1904. GANGNES: The 1898 edition adds a reference to Lick Observatory (in California), which the narrator says noticed the light before Perrotin did. From MCCONNELL 143: "a spiny shrub with yellow flowers, very common throughout England and Europe"
From MCCONNELL 135: A fictional society; the International Astronomical Union was founded in 1919. From MCCONNELL 135: "Any chemical compound containing oxygen. The surface of the cylinder has been oxidized in the heat generated by its fall through the atmosphere." From MCCONNELL 135: "a hollow tube or ball used to regulate the flow of a liquid or gas"
From STOVER 69: "a harbor beacon erected on a floating hull containing bottled gas to fuel it"
From MCCONNELL 130: Wells was also learning to ride a bicycle during this time. From MCCONNELL 127: "The clockwork would keep the telescope rotating in synchronization with the movement of its celestial object." From HUGHES AND GEDULD 200: The Daily Telegraph was established in 1855 and to this day is still one of Britain's foremost national newspapers. From MCCONNELL 127: The Daily Telegraph (founded 1855) catered to the middle class; it featured "flamboyant, often sensational journalism." GANGNES: Contrary to MCCONNELL, the Dictionary of Nineteenth-Century Journalism writes that the Daily Telegraph (1855-present; founded as the Daily Telegraph and Courier) originally catered to a "wealthy, educated readership" rather than the middle class. Though it became associated with Toryism in the twentieth century, its politics in the nineteenth century were first aligned with the Whigs, especially in its liberal attitude toward foreign policy. This changed somewhat in the 1870s when it supported Benjamin Disraeli, and the paper became more Orientalist under the editorship of Edwin Arnold. The Telegraph also promoted the arts. Brake, Laurel, and Marysa Demoor, editors. Dictionary of Nineteenth-Century Journalism in Great Britain and Ireland. Academia Press and The British Library, 2009, pp. 158-159. From MCCONNELL 127: "With a spectroscope it is possible to describe the chemical composition of a substance by analyzing the wavelengths of the light generated by combustion of the substance. It was first demonstrated in 1860." From MCCONNELL 127: Lavelle of Java is a fictional character whose name Wells derived from "M. Javelle," an associate of Perrotin's who observed a "strange light" on Mars in 1894. The evocation of Java also bears associations to the 1883 eruption of Mt. Krakatoa, which killed 50,000 people in Java. From MCCONNELL 126: Nature is a scientific journal first edited by Sir Norman Lockyer, who was one of Wells's teachers at the Normal School of Science. From STOVER 57: This is a reference to the article "A strange Light on Mars," which was published in Nature in 1894. GANGNES: This is one of the many instances where Wells establishes the novel within a framework of real scientific discoveries and historical events. This enhances the realism and journalistic quality of the narrative. From MCCONNELL 126: "opposition" means that Mars is at the opposite side of the Earth from the Sun; the nearest Mars gets to Earth. The opposition of 1877 was when Schiaparelli discovered the Mars canali and an American discovered Mars's moons. The opposition of 1894 allowed for further examinations of Mars. From MCCONNELL 126: Giovanni Virginio Schiaparelli (1835-1910) was an Italian astronomer who claimed to have discovered "canals" on Mars. Schiaparelli called them canali ("channels" in Italian) but the (mis)translation of the word in to English caused speculation that the canali might have been made by intelligent life. From STOVER 57: Schiaparelli mapped Mars during the opposition of 1877 and provided names for some surface features still used today. Richard Milner, "Tracing the Canals of Mars: An Astronomer's Obsession"
From MCCONNELL 125: In the eighteenth century England drove native Tasmanians from their land in order to turn Tasmania into a prison colony. From STOVER 55-6: "The racially Australoid natives of Tasmania survived until 1876 in a state of upper paleolithic culture. To the island's Dutch and later British "colonists, they were so many subhumans hunted down for dog meat. From MCCONNELL 125 and 151: The dodo was a large, flightless bird from Mauritius that was hunted into extinction by the seventeenth century. North American bison were also thought to be on the verge of extinction during this time. This is the first of two comparisons between the extinction of the dodo and the potential extinction of humans by the Martians; the second is in Chapter VII. From HUGHES AND GEDULD 205: "Later, the very idea of such a bird [as the dodo] was ridiculed ... until skeletal remains came to light in 1863 and 1889." From MCCONNELL 125: "struggle for existence" was a phrase popularized by Charles Darwin's On the Origin of Species (1859). From MCCONNELL 124: The idea that there were, or might have been, oceans on Mars was due to limited telescopic technology during this time. From MCCONNELL 124: the "nebular hypothesis" is Pierre Laplace's (1749-1827) theory that "the solar system originated as a single, densely compacted 'cloud' or 'nebula' of matter." 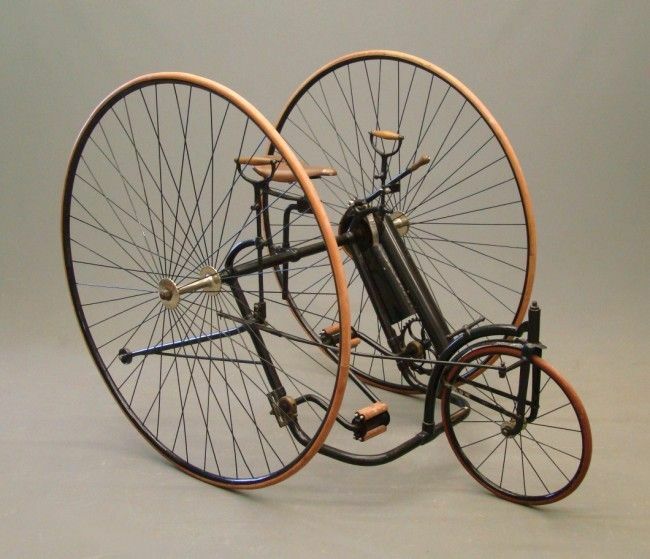 From MCCONNELL 130 and 152: Cycling was extremely popular in the 1890s; the safety bicycle was first patented in 1884, but the patenting of the first pneumatic tire in 1888 made cycling comfortable and affordable. Wells was learning to ride the bicycle around the time that he wrote this novel. From MCCONNELL 154: "Hussars are light cavalry. The Maxim is the Maxim-Vickers, the first truly automatic machine gun, manufactured in the 1880s." The Cardigan regiment is from Cardiganshire: a county in West Wales. From HUGHES AND GEDULD 206: "The Maxim gun, patented in 1884 by Sir Hiram Stevens Maxim, was an early form of machine gun. After some modification it was adopted by the British Army in 1889. In the field, Maxims were usually mounted on wheeled carriages. ... The Cardigan regiment was named for Cardiganshire, a western county of Wales located between Fishguard and Aberystwyth." From MCCONNELL 154: "The Inkerman Barracks were named for the Battle of Inkerman, where in 1854, English and french troops defeated an attacking Prussian Army. Throughout the late nineteenth century, the armies of Europe were in the process of massive and ominous expansion and reorganization. But the British had a long-standing aversion to the idea of a standing army. Their reorganization, beginning in 1870, emphasized the localization of garrisons and short enlistment terms for civilian volunteers. In 1881 the infantry of the line was remodeled into two-battalion regiments with territorial names." A boy from the town, trenching on Smith’s monopoly, was selling papers with the afternoon’s news. GANGNES: MCCONNELL is somewhat at odds with HUGHES AND GEDULD and STOVER here; H&G's identification of "Smith" as referring to the newsagent W. H. Smith is important to the print culture of Victorian Britain. I include MCCONNELL to show that critical/annotated editions are not infallible. From HUGHES AND GEDULD 205: "Cutting into or 'poaching on' W. H. Smith's monopoly of selling newspapers inside the station. The chain of W. H. Smith to this day has the exclusive rights to selling newspapers, magazines, and books in m any British railroad stations." From MCCONNELL 153: "'Trenching' means encroaching. The newsboy is selling his papers at a station where Mr. Smith has a permanent newsstand." From STOVER 91: "Reference to W.H. Smith, whose chain of stationery stores to this day has the exclusive rights to sell newspapers, books, and magazines in British railway stations." From MCCONNELL 151: "This introduces another 'Darwinian' theme of the story: the transformation of an established, normal-seeming social order by extreme stress from the outside." From MCCONNELL 125 and 151: The dodo was a large, flightless bird from Mauritius that was hunted into extinction by the seventeenth century. This is the second of two comparisons between the extinction of the dodo and the potential extinction of humans by the Martians; the first is in Chapter I.
GANGNES: See earlier note in this installment from STOVER on "much as the parabolic mirror of a lighthouse projects a beam of light." As MCCONNELL (182) notes in Installment 4: "The first portable camera, the Kodak, had been patented by George Eastman in 1888. Wells himself was an ardent amateur photographer." Even before the portable camera and the beginnings of amateur photography, the prevalence of photojournalism would have made most readers familiar with, and likely interested in, photography. References to cameras and photography, especially in relation to the heat ray, are prevalent throughout the novel. From MCCONNELL 151: "term describing an unusual state of irritability or stimulation in an organism"
From MCCONNELL 148: "Collars at the time were detached from the shirt, generally made of celluloid, and fastened around the neck with a stud." From MCCONNELL 146: "a small knoll or hill"
From STOVER 81: "The Heat-Ray is often taken as a prophecy of beam-focused lasers, but this is to miss the photographic metaphor Wells uses: 'the camera that fired the Heat-Ray,' 'the camera-like generator of the Heat-Ray.' The Martians' rayguns are in fact cameras in reverse, emitting light not receiving it, and they are in fact mounted on tripods as were the heavy old cameras of the day. What they see they zap. More, the photo-journalistic realism of the invasion recounted by the narrator recalls that of Roger Fenton, whose coverage of the Crimean War in 1855 is the first instance of a war photographer on the scene of action. His pictures were accompanied by sensational stories done by the famed William Howard Russell of the London Times, the first war correspondent in the modern sense. The narrator's account is modeled after both precedents, visually and journalistically." GANGNES: Stover here gestures to (though not by name) MCCONNELL (145), whose note is quoted by HUGHES AND GEDULD in their edition. MCCONNELL'S note reads: "Though the details of the heat-ray are vague, they do anticipate in some remarkable ways the development of the laser beam in the 1950s." That said, MCCONNELL and others rightly point to one of the numerous instances in which Wells's descriptions of technologies and events appear prescient. Indeed, many of the Martian technologies seem to anticipate military tech developed for use in the First and Second World Wars. For an analysis of The War of the Worlds and its early illustrations as they relate to early twentieth-century warfare, see Gangnes, "Wars of the Worlds: H.G. Wells’s Ekphrastic Style in Word and Image" in Art and Science in Word and Image: Exploration and Discovery (Brill, 2019), pp. 100-114. From MCCONNELL 224: "The Goths were a Teutonic people who invaded and settled in the Roman Empire between the third and fifth centuries A.D. The Huns, an Asiatic people, invaded and pillaged the Empire during the fifth century A.D."
From HUGHES AND GEDULD 215: "The Goths, a Germanic tribe, invaded Rome's Eastern and Western Empires during the third through the fifth century. The Huns, a nomadic Asian people, under their leader Atilla, invaded and ravaged much of Europe during the fifth century." From MCCONNELL 223: "[Hot-air] Ballooning began in the late eighteenth century. It was employed for military purposes in the American Civil War, and many prophecies of the late nineteenth century envisaged the wartime use of balloons for both reconnaissance and bombardment." GANGNES: Note that MCCONNELL disagrees with HUGHES AND GEDULD and STOVER here about the importance of this title. From MCCONNELL 220: "In England, the presiding judge of any court with several members." From HUGHES AND GEDULD 215: "The nearest American equivalent [of "Chief Justice" here] (although there are many differences in the two offices) would be the Chief Justice of the Supreme Court." From STOVER: "The Lord Chief Justice of England is equivalent to the Chief Justice of the United States." GANGNES: Note that MCCONNELL, HUGHES AND GEDULD, and STOVER do not completely agree on their explanations of this reference. From MCCONNELL 218: In the Church of England, the Vestry is not just the room in a church where vestments are stored; it is also committee of parishioners who arrange local matters like streetcleaning. From HUGHES AND GEDULD 214: "Vestry here is not used in its usual ecclesiastical sense but refers to a committee of citizens 'vested' with the task of arranging for such basic local services as health and food inspection and garbage disposal. St. Pancras (then a London borough) is located northwest of the City of London." From STOVER 161: "A public-health committee of that city district responsible for its garbage removal--a task now beyond its capacity as all public services are overwhelmed." From MCCONNELL 216: "The East End of London, until well into the 1930s, was a notorious working-class slum." From MCCONNELL 210: "The first British destroyer, the Havoc, was commissioned in 1893. The development of steam power in the second half of the century had revolutionized the concept of naval warfare, and put in jeopardy Britain's traditional bulwark of defense, the Royal Navy. In the growing war-fever at the end of the century, much concern was generated around what seemed to be the increased power of European navies, especially the French, and the Naval Defense Act of 1889 laid down rules for the refurbishing of the Navy similar to those which had earlier attempted to reinvigorate the Army." From MCCONNELL 207: "A tall, dense, puffy cloud. Many readers during the First World War viewed this as a forecast of the use of poison gas." From MCCONNELL 188: "In Genesis 18:20-28, the Lord sends fire from heaven to destroy the sinful people of Sodom and Gomorrah." From MCCONNELL 184: "welt or ridge"
From MCCONNELL 183: "a path along the bank of a river for the horses or men who tow boats on the river"
From MCCONNELL 183: "The word [used in this way] was still new at the time, and referred primarily to factory whistles." From MCCONNELL 182: "an abrupt rise of tidal water flowing inland from the mouth of an estuary"
From MCCONNELL 180: "willows cut back to the trunk, so as to produce dense masses of branches"
From MCCONNELL 178: "the priest of a parish"
From MCCONNELL 178: "The insignia, then as now, of the Red Cross, founded in 1864 as a result of the Geneva Convention on international warfare." From MCCONNELL 176: "First isolated in 1825, aluminum ... began to be produced in massive quantities only after the discovery, in 1866, of a cheap method of production by electrolysis." From MCCONNELL 173: "four to eight guns in the Horse Artillery of the time"